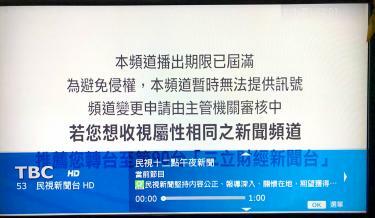 A screen grab from cable TV provider Taiwan Broadband Communications yesterday shows no signal from the Formosa News channel with an announcement that it has temporarily been unable to obtain broadcast authorization from the channel. Formosa TV (FTV, 民視) has accused Hon Hai Group (鴻海集團) chairman Terry Gou (郭台銘) of politically motivated censorship of the media after Taiwan Broadband Communications (TBC, 台灣寬頻通訊) cut access to FTV-owned channels yesterday morning. TBC said it removed the channels Formosa News, Formosa Taiwan and Follow Me TV from its service because FTV had not authorized TBC to use its channels. FTV last year packaged the three channels in one deal, but TBC only wished to broadcast Formosa News. An inability to arrive at a solution necessitated National Communication Commission (NCC) intervention. The NCC ordered FTV to grant TBC temporary access to its channels until May 15. In a statement issued yesterday to the 700,000 affected households in Taichung, southern Taoyuan, Hsinchu County and Miaoli County, FTV accused Gou of politically motivated censorship of the media. The allegations refer to the purchase of Macquarie Asian Pay Television by Hon Hai business group president Lu Fang-ming (呂芳銘) last year. Gou invested by contributing 20 percent of cost. TBC is wholly owned by Macquarie Asian Pay Television. An opinion letter sent to the committee reviewing the acquisition last year stated that a Taiwanese investor looking to finance and manage a Taiwanese cable TV network from overseas would be a potential risk to national security, FTV said. The letter said the investor would be susceptible to Chinese threats or a takeover due to H0n Hai’s sizeable investments in China and such a susceptibility could negatively affect media freedom in Taiwan. TBC has received more than NT$1.5 billion (US$50.5 million) in subscription fees so far this year, yet it refuses to pay the several million NT dollars for authorization, FTV said. FTV’s authorization fees are two-thousandths of that of other multiple system operators and only one-tenth of the amount charged by news channels, such as Sanlih E-Television (三立電視), FTV said. FTV added that it strongly suspects ulterior motives behind TBC’s abrupt removal of the channels, a move that FTV said contravenes NCC regulations. In response, TBC said that Lu’s purchase of TBC was a personal investment and unaffiliated with Hon Hai. TBC had previously broadcast Formosa News without charging its subscribers, but FTV’s demands on Dec. 25 last year had been unreasonable and could have contravened the Fair Trade Act (公平交易法), it said. FTV wanted to bundle the three channels into one package and demand a monthly NT$2 surcharge per user, it said. “We care about upholding consumers’ rights,” TBC said. The NCC fined TBC NT$60,000, and demanded that TBC and FTV immediately resolve the impasse. Any action infringing users’ rights would be fined between NT$60,000 and NT$3 million according to Article 63 of the Cable Radio and Television Act (有線廣播電視法), NCC spokesman Wong Po-tsung (翁柏宗) said.